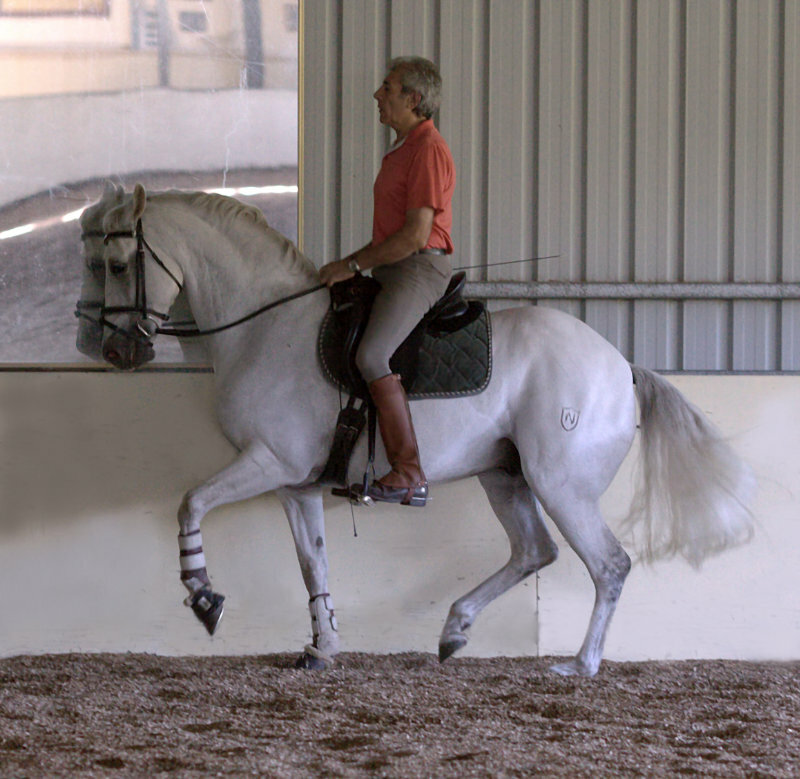 Manolo has been training this way and followed his fundamental principles of training for wellness since 1974 and with every year and with every horse, it becomes clearer to him that there is no neutral point in training. Every step matters and the posture we ask our horse to travel in has a direct bearing on his wellness both mentally, emotionally and physically. „My style of training emphasizes a soft, swinging back, making sure all the joints in the body including the hindquarters are moving freely and evenly, and making sure I have even diagonals in all paces. I will ask for this before I ask the horse to seek the bit. It is a conscious decision rather than a training error on my part. I encourage the horse to distribute his weight evenly over his four feet, and to become a partner. In the early stages of training, I encourage him to be free with his head and neck, to keep the poll supple and the troatlatch soft and open, and to travel with his eye level with a point between the stifle and the hip depending on his conformation so his muscles build from strength to strength. I do not ride purposefully behind the vertical nor do I shorten or stack the neck. The horse learns to relax through the poll and jaw and to carry himself and me with ease. I use this early work to develop straightness, balance, rhythm, flexion and regularity in all paces – a crucial basic foundation. Along with riding, I use in-hand to encourage the horse to use its entire body. Before I ask a horse to work, I want to know its history. Has it had problems or an incident that would leave it mistrustful of people and resistant or defensive? If the horse does not like me at the start of his training, I spend time to be a friend. Only when the horse’s trust is established will it work in a positive way, relaxed in body and mind. I adhere to the principles of traditional dressage and Article 401, which preserves the horse’s body instead of wearing it down, and gently nurtures his mental wellbeing, so that the physical and mental aspects work in unity. Many horses today have become so far separated from their essence, or the harmony that comes from the mind and body working in synchronicity, that they suffer needlessly each day of their lives. I witness this damage as part of my work. My work is about sharing with others the importance of the partnership, the joy of the dance that can be experienced by horse and rider when body, heart and mind are working in a shared partnership. The horse is an athlete, a partner in the dance and as such, should be treated with the greatest respect, care and consideration.